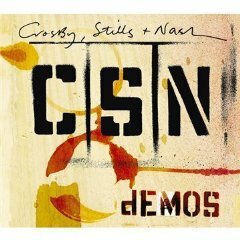 Somehow, it took awhile to get around to checking out the new Crosby, Stills, and Nash release Demos. Must've been because that other guy released his Archives or something? Well, I'm sure the CSN guys would be miffed if their work ever got overshadowed by Neil. So we'll devote our undivided attention to Demos. As you know, David Crosby, Stephen Stills, and Graham Nash helped define the Woodstock generation. Their harmonies, songwriting and commitment to political and social causes made them an international super-group in the early '70's. This 12 song compilation of previously unreleased demos is from 1968 to 1971 and for the most part provides quite an insight into familiar songs' evolutions. Crosby and Stills can be heard on the demo of "Long Time Gone" recorded in June 1968, just a few weeks before Nash joined the group. Neil Young, whose arrival in 1969 launched CSN&Y, performs with Crosby and Nash on "Music Is Love," a song the three cowrote that appeared on Crosby's 1971 solo debut, If I Could Only Remember My Name. Crosby performs as a solo on the demo of "Almost Cut My Hair". Stills performs unaccompanied on a 1968 demo of "My Love Is A Gentle Thing." Recorded in 1968, the song was never released on a studio album, although a 1975 recording of the track did surface in 1991 on the boxed set CSN. More than half of CROSBY, STILLS & NASH DEMOS comprises early versions of songs destined for solo projects that each member focused on following the success of Déjà Vu. Stills released his self-titled debut in 1970, which introduced "Love The One You're With," his biggest solo hit to-date and a live favorite. Stills recorded this version in April 1970, more than six months before recording the album version in London. Another Stills demo, "Singing Call," features a song that would appear on his follow-up, Stephen Stills 2. Nearly all of the tracks on CROSBY, STILLS & NASH DEMOS were recorded at Wally Heider studios, a popular recording destination on the West Coast for everyone from Jefferson Airplane to Creedence Clearwater Revival. Nash chose Heider's studio to record his 1971 solo debut, Songs For Beginners, demoing much of the album there as well. This collection includes three of those demos: "Sleep Song," "Be Yourself," and the politically charged "Chicago." Listen to track samples and view "Marrakesh Express" video on Amazon.com. 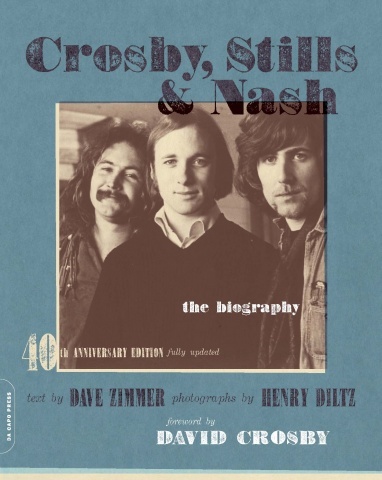 Also, see review of Dave Zimmer's book CROSBY, STILLS & NASH: The Biography. Lastly, here's an interesting take on comparing Fleet Foxes’ career so far to that of Crosby, Stills, Nash & Young on Crawdaddy! magazine. I have always been a very fervent Stephen Stills admirer. His double Manassas album being possibly top 3 all time for me. I had the great pleasure of seeing him live at the symphony hall in Birmingham UK last year. He looked and sounded great. If only Stillsy had kept as focused as Neil over all these years imagine the canon of material he would have. Stills at his best is incredible. There was just never enough of it! I also saw Stills in Birmingham last October! :O I agree with that sentiment about being as focused as Neil... Stills has something magical about him. Personally, my favourite of the three has always been David Crosby, his "If I Could Only Remember My Name" album ranks up there as one of the greatest of all time in my opinion, it's virtually flawless, and in particular, the song "Laughing" is just stunning. Another favourite of his is the brilliant "The Lee Shore" - great lyrics and it sounds fantastic performed live with those unique Crosby vocals. It's just a shame it took him so long to release a follow up. I'm watching CSN in Manchester in a couple of weeks, i've never seen them live before so i'm really looking forward to it. Ya know, If 4way street included some of these tracks such as Wooden ships, almost cut my hair and Country Girl it would have been my all time fav CSNY live album...Neil has definitely set the benchmark for archival compilations..but I'm not surprised heh!